I've been getting more organized this week. I found this article about how to be a productive artist. 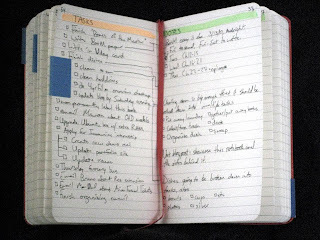 After some more research, I found two great articles: The Top 10 Sources of Interruptions and Getting Ready for 2010: My Moleskine Setup. After reading these articles, I went out and bought two new notebooks: a small, red, lined Moleskine and a slightly larger blue Pentalic. I've set up the red one as a sort of Goalbook, organized like the third article mentioned above. I've got a list of my current projects, long term goals, short term goals, "someday maybe" goals, daily/weekly checklists, current tasks and related notes, and a section for information and reference. The blue one is a sort of thought-capture/brain-dump book that I'll be using for random thoughts and notes that distract me as I work. Despite only having the books for a short time, I'm already finding my motivation levels higher. I have a difficult time working towards my goals unless I have them in a concrete form that I can check back on as needed, or tick off when done. Having them in a little book that I can keep with me and add to whenever new tasks pop up keeps me focused and gives me something to aim for. The blue book should be enormous help, too, since my worst distractions while working are the random thoughts that pop into my head and refuse to leave until I give them the attention they want, usually in the form of Wikipedia research. Having a place to write them down for later perusal should keep me much more focused, because I'll know that I won't forget to look up whatever it was that seemed so important at the moment. The other fun part of getting the notebooks is personalizing them. Now that I'm accumulating more hard-bound notebooks, I feel like I need to label them and make covers for new ones as I get them. 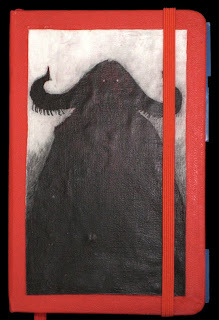 Thus, I took my Moleskines and the Pentalic, labelled the spines, and have created a cover for my Goalbook. The art is by an artist who goes by Nivbed (one of the first artists I followed online, and I still absolutely love his work), and the piece is called Vigsen. I applied the image by printing out a copy on normal printer paper, brushing a couple layers of clear acrylic medium to form a tough skin, then wetting and rubbing off the paper. The result is a thin piece of flexible plastic with an imprint of the image on the backside. (When done with a greyscale print on white paper, the white becomes transparent, a la Flaming Pear's "Ghost" filter, allowing the ground's color to show through.) I added some acrylic gouache to the backside to highlight the outline and the eyes, then used more acrylic medium to bond the transfer piece to the cover of the book. You can see from the inside shot that I've got the whole thing divided up using sticky tabs, and that I've got dedicated pages for certain types of data (in this image, Tasks on the left, related Notes on the right), plus indicators where tasks and data are related. I've also numbered most of the pages, leaving some blanks because I was lazy and I won't get to them in a while. I'm really excited about the whole notebook thing (notebooks, sketchbooks, nice paper, and quality writing materials are all guilty pleasures), and I'm hoping that this will help keep me on track. I may post some updates in the future to see how much use I've really gotten out of them.